So as you know I was all excited to buy the very first Microsoft Surface Pro. I bought the 128 GB model because I knew that despite the fact that I have all sorts of external hard drives I was even likely to ax out 128 GB pretty quick. Fortunately between Cloud-based storage (SkyDrive for my personal stuff, SkyDrive Pro for my business files) and the ability to add a micro-SD card I would be fine. I arrived at my hotel in Redmond and the package from my Amazon.com seller was there; I excitedly ripped it open and inserted the 64 GB card into the Surface Pro, reformatted it with NTFS, and installed the SkyDrive Desktop Client on Windows 8 (which allows me to synchronize my SkyDrive files onto my device’s hard drive or, in this case, its SD card. 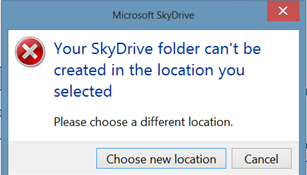 Wow… ‘Your SkyDrive folder cannot be created in the location you selected.’ This was really disappointing, because that was exactly what I wanted to use my SD Card for… along with my Document, Picture, and Music Libraries. I will be honest, it never occurred to me that I could not map these to external drives, although it does make sense. However I was planning on making this SD Card a permanent drive in my Surface Pro, so I needed to find a way to do it. 1) I created a directory on my C Drive called c:\SD Card. 2) I opened Disk Manager in Windows – you can either do that by right-clicking on the bottom-left corner of your screen and selecting Disk Management. If you are on a tablet and have no mouse, you could alternately pull up that menu by clicking Winkey-X. 5) In the Add a new drive letter or path for X: (Where X is the drive letter represented by your SD Card) select the radio Mount in the following empty NTFS folder:. 6) Click Browse…and navigate to the directory that you created. Click OK. The SD Card has both a drive letter and the mount point on the C drive. If this is what you see then you are ready to proceed. Cancel out of this window and close the Disk Management console. I started the SkyDrive desktop app again and instead of mapping my SkyDrive folder to D: I mapped it to C:\SD Card\. That looked a lot better. I was able to proceed and my SkyDrive files are now synchronizing properly. Notice that the Pictures (C:\SD Card) is at the top of the list, and has a check mark next to it. That means that when I start saving pictures (or decide to import them from another profile) they will go onto the SD card and not onto the internal drive. All of these steps will work for tablets but also for hybrids, laptops, and even desktops. It is a simple mechanism to convert external storage to internal storage. The mount point on the C drive is used as a hard link to the SD card, and nothing stored in that directory is actually on the C drive… it just looks that way to ‘fool’ Windows into doing what you want to do. 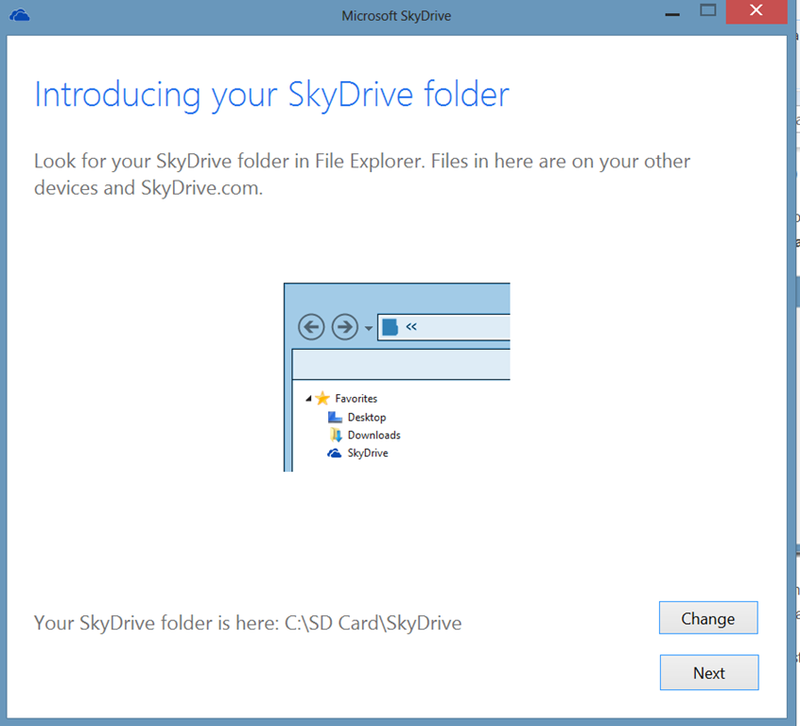 Question – how can I apply it after already have the SkyDrive in place? I couldnt find any relevant setting in the settings option of desktop SkyDrive. Comment – I’m using that way of mounting for Libraries for a while now and I find it much slower to open than accessing the SD card directly. Any idea why or how to improve? This is awesome! But what will happen if you remove the sd card? I tried this and put in another SD card. Once I went back to the original one it was no longer mapped. Also the new one didn’t show up in the mapped folder on C:. Thanks for the info… Actually I was curious about it too. Something got messed up and now it cant format my card even, I need help!! I’m confused, the properties window I have is completely different from the one in the picture. Any idea what could be happening? hi and thanks for the info! Can you also write about a safe way to undo the procedure? thank you in advance! 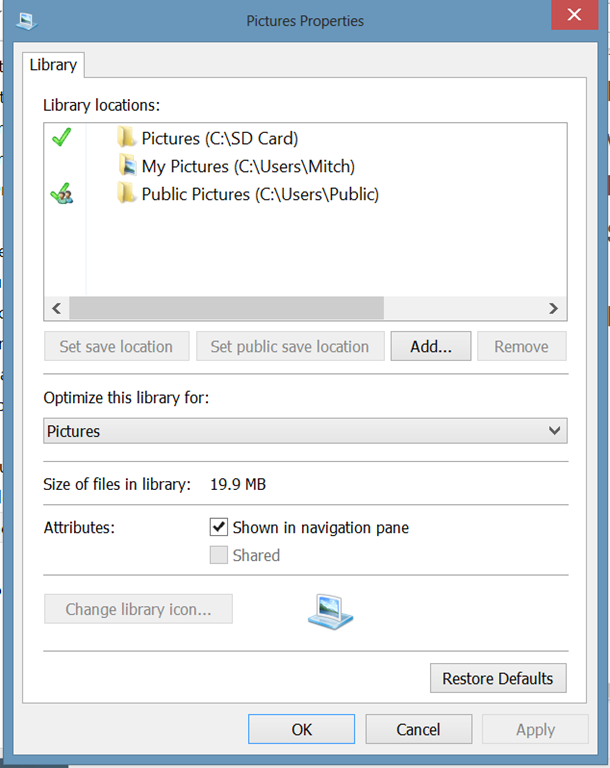 Mitch, I have one question….. On step 1 I have to create a directory on C: with which name “SDcard” or “C:\SDcard” ? I tried this on Windows 8 as this is what i used to do with win7, but even with the card in NTFs and with it mapped to the folder, it still tells me to use a different location. How to undo all of this? and make everything back to normal? when i’m trying to do step one, c:\SDCard it says I can’t use the (:) what do I do? what’s happen when i delete file on sdcard? 1. permanent remove or 2. it’s move to recycle bin? If you delete from the SD Card it goes into the Recycle Bin. Why it says the location cannot be indexed and thus I cannot move the folder there? clever use of the system possibilities, elkegant, helpful… kudos! I bought a little HP Pavilion X2 for travel, and maxed out its 64GB very quickly! I was looking for a way to move my Box Sync contents over to a card, and this seems to have worked. Thanks! Briliant, Mitch! Worked perfect using Win 7 Pro. I have a Dell XPS 18 running Windows 8.1. I don’t care about hooking OneDrive up to my SD card, but I want deleted files to go to the Recycle Bin. After I went through these steps I made sure I was accessing the card through (OS) C:\SDXC, created a dummy text file, and hit delete. I got the messagebox asking if I’m sure I want to permanently delete it. Hi, M! Well, um… *cough* …the article you linked is the article I’m responding to with my comment. Hi Mitch, this link brings you straight back to this page. Windows 10, Onedrive for Business, syncing just fine. If I try to delete a file it asks if I want to permanently delete it. Tested it and although it does delete it permanently it is in the Onedrive for Business online recycle bin. I’ll re-read your article in case I’ve missed something. I have an HP Stream 11 running 8.1. I followed everything to the letter but cannot map OneDrive for Business to the SD Card. I was really hoping this would work. Unfortunately I’m going to have to return it for a PC with a larger drive and much heavier and uglier footprint. Sure you can Scott! Follow the instructions written out in this article: https://garvis.ca/2013/02/21/converting-an-sd-card-to-permanent-storage-in-windows-devices/ and you will be able to use your Stream 11 the way you want to! Mitch. I already did all that and I get the following: “Sorry, we can’t save your documents to the chosen location. Please try picking a different place on your computer.” I don’t think this workaround works with OneDrive for Business. Only OneDrive personal. Scott I don’t know what to tell you. I know for a fact that I have done it with OneDrive for Business, but it’s been a while. I have a new 128GB Micro SD Card waiting for me to pick up from my PO Box in the USA, and I will try it when i get it ok? Thanks for sharing! And I only have one question, what’s the different if use mklink to create a symbolic folder? Thank you. Hi Mitch, thanks for the sharing! I have one question, what the different if use “mklink” to create symbolic link? Thank you! Thanks – used the same process to mount a 4Tb USB drive. Used the same trick for my Dropbox folder! Only warning is here it might delete your files if the folder is not accessible when Dropbox is open. (I know, that’s a serious failure on their part.) BTW, I was able to move my OneDrive storage by just moving the location of the subfolders to my SD card (on a Lenovo Yoga Tablet). Update: I upgraded to Windows 10, and there seem to be some changes to OneDrive that make this procedure either different or impossible for OneDrive. Before the update, you could change the location of the libraries or folders and didn’t have to go through this procedure for OneDrive. Now i can’t see how it can be done. I have switched to Google Drive, especially since the “placeholder” feature (you can see what files you have, even if they are not downloaded to the particular machine you are using) is now gone with OneDrive! If Windows is giving you hassles formatting and partitioning your SD card just use MiniTool Partition Wizard. I have a tiny little Dell Mini 9, and windows 10 just got shoe horned into it. With just 14gb available on it’s tiny little 64gb ssd (Slow Solid Drive), I simply had to use the SD drive for storage. I even think the Cat 10 sd card is faster than the SSD. Anyways, this process works like a champ. I’m using a Sony Cat 10 sd card, and OneDrive didn’t even blink when I told it to use C:\sdcard. I just put Win 10 on my Dell Mini 9, and not having any issues at all. I have Onedrive going to C:\SDCard and it didn’t even blink at it. If you are having any troubles formatting the SD drive us MiniTool Partition Wizard. It is much simpler interface and just barges through all the Windows nonsense and does it. The problem is every now and then the SD Cards suddenly unmounts, and even reinserting it doesn’t fix it. I have to reboot to get it working again, any advice? Mitch, I bought a win8.1 hybrid device with only 16GB internal memory. My memory is almost full and know I want to do the win10 upgrade. When I tried to do it, win update gives an error message saying that its not possible to do it, cause low internal memory. I have a 64 GB microSD card for personal files. My question is, can I do the procedure above to up my internal memmory so I may be able to do the win10 update? Worked like a charm to sync files to dropbox. You are terrific! Thank you so much! I am glad to help Barbara… And everyone! Hey I used this process and it seems to be working but my question is this, will this prevent the C drive from going into the red and having low memory, or will the computer still think I’m spring all this stuff in C drive and fill up the memory that’s actually going into the SD card? Because so far the added Gbs seem to showing as in C drive. What will happen once I go over the computers capacity? Will it just keep telling me my memory is full? Rachel it should not store anything on your hard drive. If it is filling up your C drive you may have missed a step. Firstly that is a great computer… I love mine! Secondly I don’t know how Vudo works – it might save to a different location from the default. That could be the issue. For apps that can’t, you can try mapping its data directory e.g. from AppData/Roaming/uTorrent to C:\SDCARD\uTorrent using mklink. Note: mklink works even on non-ntfs, eg on fat, fat32, exfat drives. Mitch – you have written some great instructions here but my hair is falling out trying to get W10 to comply. I have laptop with 32Gb SSD and I have installed a 64Gb SD card formatted as NTFS. I got everything working great exactly as you show, all my mappings went to the SD directly or through the C:\SD mapping as Windows would allow. THEN I plugged in my backup USB drive and BAM the SD card drive gets bumped from D: up to F: and the USB takes over the D: name. SO… I went to disk management and assigned drive V: to the SD. It all worked fine until I plugged in the backup drive and BAM my SD card gets reassigned from V: to F: again … so my problem is to have a way that the SD card can be locked to a permanent drive letter. Any tips??? After moving to Windows 10, I am desperate because I cant have Onedrive synced with my external SDCard. So I tried this. It semt to work (I mounted SD card to c:\SDCard and then linked Onedrive to C:\SDCard\Onedrive). Un fortunately, after that I get blocked when I try to sync fiolders that make up to above 30Gb, because my C Drive has only 30Gb left Although the SDCard has more, the process sems to take into accoun,t only what is available on C.
Great soluton. Works fine also with Dropbox. Thanks. I mapped my SD card to my hard drive last year to load Dropbox onto my SD card, because I don’t have enough space on my hard drive. I since have had to restore my netbook to it’s original state and reload all programs. My dropbox folders are still located on my SD card, but I am having trouble relinking to Dropbox. When I install Dropbox, I can’t choose the SD card. I tried re-mapping the SD card, but don’t seem to be doing it correctly. Dropbox still reads it as a removable disk. Any ideas? i used similar procedure of yours as i have faced the same exactly problems with my yoga2 lenovo and my Dropbox Pro account…. I’ve managed to solve my own problem, but it is not exactly the simplest solution. In a nutshell, instead of storing files on the SD card, which of course Windows sees as a removable drive, it is possible to instead fill the entirety of the SD card with a virtual hard drive, which can then be mounted in Windows, and is treated as an actual hard drive. Optional: clear out the contents of your SD card. This is not absolutely necessary, but the amount of free space on the SD card will become the amount of space on your new disk. Open Disk Management (from my Start menu search, it shows up as “Create and format hard disk partitions”). Optional: ensure that your SD card is formatted to NTFS. As the card will be a permanent fixture and cross-platform compatibility doesn’t matter, might as well go with a more modern file system. Furthermore, this wlll enable the next optional step directly below. 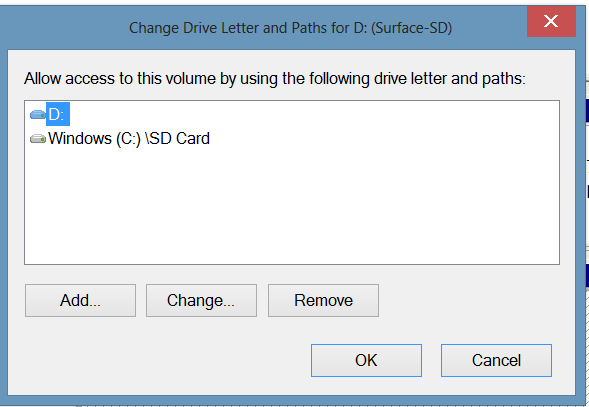 Optional (only possible if you chose to format the SD card to NTFS): select the partition on your SD card, and choose “Change Drive Letter and Paths”. Remove the drive letter and add a new mount point to an empty NTFS folder. You can stick this somewhere onto your main drive, I chose “C:\Media Container”. This way, the SD card won’t show up anymore as a separate drive anymore, but can still be accessed by the system for the virtual drive. Under the Action menu at the top, select “Create VHD”. Browse to your SD card location (“C:\Media Container” if you changed its mount point to what I suggested above). Create a VHD here… I called mine “Media Store”. I also changed the virtual hard disk format to VHDX for its resilience to power failure events, though I have no actual insight into this beyond what Windows described it as. I stayed with the recommended dynamic expanding disk type, with the thought that this could be useful if I get a bigger SD card in the future. Right click on the new disk (on the left, now on its partition), and choose initialize. I went with a GPT partition table, as it is a newer design and presumably better, though I have no other insight on this. After it is initialized, right click on the new unallocated partition, and choose “New Simple Volume”. Follow the wizard, allocating all space to the new partition, assigning it the drive letter you would like your new hard drive to use (probably D:), and formatting it to NTFS. If all went well, you should now see your new hard drive available in Windows Explorer. Now, the trick to bring it all together is to set up Windows so that the drive is mounted when the computer boots, as it’s no fun having to go into Disk Management each time your computer starts to mount the drive. To do this, you’ll need to create a script for mounting it, and then using Task Scheduler to execute the script on boot. I found a really good guide here, which I’ll summarize below. Open Task Scheduler under Computer Management, which comes up in my Start Menu as “Schedule tasks”. On the right pane, select “Create Task”. On the General tab, enter a name of some sort for your task, I called mine “Mount SD card”. Under “When running the task, use the following user account”, change it to SYSTEM by typing it in the object name box. Also, it may be important to set “Configure for” to your operating system, I’m not really sure and a quick search online didn’t really explain what this setting does. On the Triggers tab, click New, and set “Begin the task” to “At startup”. On the Actions tab, click New, and set “Program/script” to “diskpart” (without the quotations). Under “Add arguments” paste in the following with the path set to your script’s path: /s “C:\Media Container\Mount Script.txt”. On the Conditions tab, clear the checkbox for “Start the task only if your computer is on AC power”. You can also go through the options and see if there’s anything else you’d like to set, but those should be the essentials. And that’s it! Next time your restart, you should see your storage space on your SD card being mounted as a hard drive. I followed all the step and mounted an external hard drive instead of an SD card. That all worked fine. However, when I try to move my dropbox folder (about 100 gig) to that externally mounted drive, it tells me there isn’t enough space even though there is 2 TB. So it look like it is looking at the C: drive as the destination and not the mounted drive. Any suggestions? Map a drive letter to the 4tb drive too. Move the dropbox folder to the mapped drive letter, not the mapped path. Then, reconfigure dropbox to use the mapped path, not the mapped drive letter. Or use a 3rd party copier or file manager, eg. TeraCopy or Total Commander for the move operations. Thanks Mitch. Works fine for me, but I still have a copy of all the original files in the C\SD Card directory. Is it possible to delete these, without losing the ones on the SD Card? GENIUS!! Best solution I found! Thanks a lot!! Saved my life! I was almost throwing my Windows tablet through the dawn window! Silly question, but with windows doing TRIM / optimalisation weekly won’tthis mess with your card? I wish I could tell you Sebastian… I would need more information. I have a LINX Tablet with 32GB Internal Hard Drive (C) running Windows 10. Also I have inserted a 64GB SD Memory Card (Drive D). I was advised Win 10 had an upgrade but when I tried to upgrade was given message “Insufficient Disc Space available; 16GB required”. All that is on the C Drive is Windows 10 & Program Files leaving 8.9GB space. All my Documents are on the SD Card leaving approx 40GB space. Can I move everything off the C Drive onto the D Drive to enable the upgrade to be downloaded without causing any issues to the Tablet operation? I believe if you put a large USB thumb drive in the machine it will allow to upgrade moving temporary files to the USB during install. Sorry if is about a year ago I did it, and I forget the exact steps. Also look for previous systems files hidden in Windows.old folder using the disk cleanup tools. If you Google upgrade W10 on 32 GB you will find several examples of guides. I used same process with Dell 32gb tablet and 64gb SD. This was so helpful until I got the point where you change drive letter and paths and your screen shows both options. Mine will only show one, then if I try to browse then click OK, it doesn’t allow the OK to be clicked.. Why is my laptop not working as yours did? wow! I actually removed the driver letter (so it doesn’t appear under drives) and only mapped to c:/sdcard. I think its cleaner this way. Excelent.. you save my tablet HP7, Thanks a lot. I mounted a microsd card to the c: drive on my surface pro 3 and everything has been working fine. One issue is that the computer keeps telling me I am low on storage. When I ran disktective, it shows that the contents of the microsd card are being included in the hard drive storage calculations and causing it to appear nearly full. Can you help me sort out this issue? Hi Denny. I’m afraid it won’t. It will not affect anything outside the directory link. Some installers DO read your TEMP path during installation, and of course it will refuse because C: now have 1GB free while sdcard (the intended install location) have 16GB free. Now run the installer FROM inside the same command prompt window. You might also have to cd to the installer’s directory first, in case of CD/DVD like setups, but I won’t cover command prompt commands here, you got the point. Hi Mitch, thanks for posting this! Is it possible to create two folders mapped to two different locations on the SD Card? i.e. Let’s say I have pictures in one folder and music in another on the card, can I map them to C:\Pictures and C:\Music? Under that mount point, create Pics, Vids, whatever. Can I do this process for Dropbox, and if so how? Is there any solution for such things. Plz help coz , even though my tab say internal memory is 32 GB it has only 18GB after full reset. Ifraz I always prefer internal storage for apps… I suppose it could work though. It could work. But you might have to either have a drive letter mapped to the sdcard, or not, by simply choosing a install location under the mapped ntfs path during installation. But beware, if the card is removed even for a while in the future, it might cause registry errors or other messes, including but not limited to: unable to launch, association errors, unable to uninstall or worse, even unable to reinstall. You might have to full wipe/reset the pc in order for things to be normal again, and of course reinstall everything. You have been warned. Hello Mitch, Thank you for your post! May you please tell me if there is any way to have onedrive sync both drives c: and d: (sd card) at the same time? Thank you in advance! I would like to state that the VHD method is the only way I could install programs on the sdcard in my Lenovo Miix2 tablet on Windows 10. However, once the VHD is created, newer versions of Win10 upgrades won’t install. I have to remove the sdcard in order for the upgrade to work. Then after the upgrade, I have to recreate the VHD all over again. Kinda frustrating especially when you have forgotten the complicated steps. Wish MS can look into making this work in a more easier way instead of just thinking of selling higher end Surface hardwares with bigger storage Rams and making life difficult for all tablet users with sdcards. I have adobe LR set up on a HP Stream, and use this setup to edit Ice hockey photos, in period breaks, and then send to the press. I have a 64gb Micro card i wanted to use to store the few photos i need to work on so; will this also fool lightroom into the fact that the SD card is now a hard drive, as lightroom will only ‘add’ to its catalogue if the image is on a hard drive. I don’t know Steve, but it is definitely worth a try! Let me know if it works!